A couple of weeks ago, while watching Kay Mellor’s BBC1 drama The Syndicate, about a group of supermarket workers who win the lottery, I found myself staring at the character of Annie, the partner of store manager Bob. She looked remarkably like Joanne Froggatt, who plays Anna in Downton Abbey. Annie is played by Katherine Dow Blyton, who had a fairly long run in Hollyoaks and has played several characters in Coronation Street among an extensive non-soap CV. After putting out a general enquiry on Twitter, I was told by one follower that (as a relative of Blyton) she was able to confirm that they weren’t related. But I had far more people tell me that they had been thinking the same thing. And because my blog’s pages include my tweets, my query about the two actresses ended up with an increase in traffic to this site by people who were clearly wondering the same as I. @scottm Kath DB is an awesome actress, worked with her many times at @YorkTheatre back in the day. I was just wondering the same thing while watching Katherine on Silent Witness. They are so similar with such similar mannerisms. Amazing! Joanne Froggatt and Katherine Dow Blyton not only look alike, but they have similiar mannerisms. Hi Scott, I was just watching Episode 4 of the first series of Monroe, where KDB played the wife of a patient. I instantly thought it was JF, but thought her eyes looked dark and was wondering if she was wearing contacts. On further investigation I found your blog. Yes the resemblance is uncanny! I have just watched The Syndicate and thought the same thing…hence googling the actresses and finding your blog. Weird! My husband & I are watching The Syndicate now in Australia and he is 100% convinced it is JF. Not even your blog will convince him! Watching in Australia too and had to Google it…can’t believe it’s not the same person. Was just googling to find out this very fact – thank you! Hi Scott, I just watched The Syndicate on Hulu and I thought the same thing. 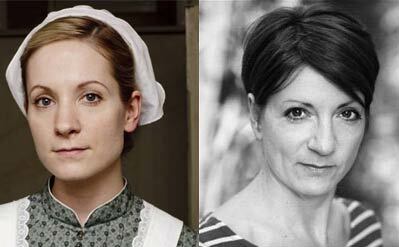 I could swear that Annie on the show and Anna from Downton Abbey were the same person. They even sounded alike. It is amazing! That is how I came across your page as I was looking up to see if they were in the same person or a relative. You have now answered my question, so thank you. But they really are dead ringers for each other.